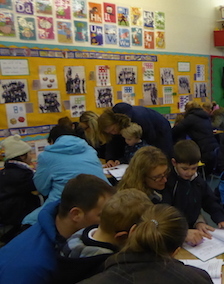 On Wednesday 18th November, parents and grandparents of Reception class came to see their children’s Learning Journeys. These journals are a record of their child’s progress and achievements and all the busy things that they have been doing at school so far. We had a remarkable turnout of parents and it was an absolute pleasure to see the children enthusiastically sharing their work with them. The parents were all sent home with ‘proud clouds’ so that they can contribute achievements outside of school. Well done to all the Reception children for being really proud and their family for coming in to share.